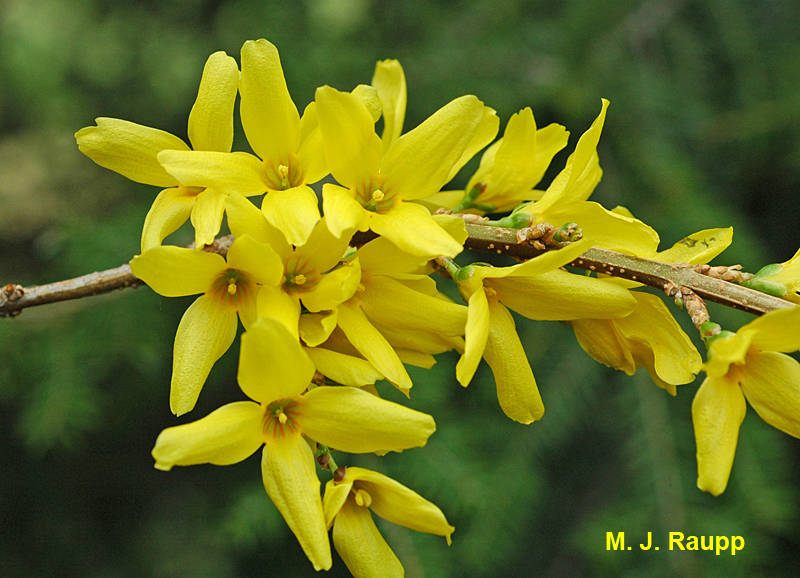 Forsythia blooms are a harbinger of both spring and the appearance of eastern tent caterpillars. While forsythia’s bright yellow blossoms are the harbinger of spring, they also mark the emergence of an impressive tree pest, eastern tent caterpillars. Since last summer, this pest has survived as eggs on the small branches of cherry, apple, and crabapple trees. Even though this spring was been unseasonably chilly, tiny caterpillars are now hatching from the dark brown, Styrofoam-like egg masses. This week they can be seen near their egg masses hunkering down to await the appearance of nutritious young leaves. More than 300 hundred larvae can be found in a single egg mass. Tiny eastern tent caterpillar hatchlings emerge from their Styrofoam-like egg mass and huddle together on a cool spring day. Larvae build small silken tents over the egg mass and the surrounding branch. From this bivouac, they move along silken trails to the newly expanded leaves on which they feed. Trail marking chemicals called pheromones are deposited by the caterpillars as they return to their tent after dining. These trail markers assist nest mates in locating delectable clusters of leaves. As larvae grow during March and April, they need more room so they expand their tents. Eventually tents are constructed in the crotches of large branches or where large limbs branch out from the trunk. Eastern tent caterpillars are rather a chummy lot. The eastern tent caterpillar is a beautiful beast with blue stripes and patches on the side and a white stripe down the center of the back. Brothers and sisters from the same egg mass often participate in group activities such as communal foraging and enlargement of their remarkable tent. Tents help caterpillars conserve heat and elevate their body temperature for more rapid growth and development during chilly spring days. Their silken homes may also provide protection from predatory or parasitic insects. These hairy caterpillars have a voracious appetite and can strip even large trees of their leaves when many tents are present. After the caterpillars have completed development, a mass exodus occurs from the tree and the larvae wander the land seeking protected spots beneath logs, leaves, stones, and under man-made structures to spin yellowish or white, silken cocoons. The adult eastern tent caterpillars emerge as moths from their cocoons in June or July, mate and lay eggs back on the small branches of rosaceous trees such as cherry, apple, and crab apple. These eggs house the next generation of caterpillars that will emerge with the bloom of forsythia next spring. Small, and sometimes even large trees, may be stripped bare by hungry tent caterpillars. How do you know if eastern tent caterpillars threaten your trees? The best predictor of a problem this year may be the problem you had last year. The images of this bug of the week came from a small stand of wild cherry trees that are perennially infested with eastern tent caterpillars. If you had a cherry, apple, or purple plum with tent caterpillars last spring, now is an excellent time to carefully inspect the pencil sized branches for egg masses and tiny silken webs. The egg masses are easily removed with a pinch of the fingers or, if you are a bit squeamish about touching bugs, simply get out your nippers and prune them out. As the tents enlarge and move to the crotches of the tree, tents and their inhabitants can be removed with a gloved hand on a cool day, placed in a bag, and destroyed. The old school remedy of “burning them out”, though dramatic, went out with the storming of Frankenstein’s castle. Flames are very damaging to the bark of a tree and should not be used. Tall trees festooned with tents may be totally stripped of leaves. While trees may recover and produce a second flush of leaves, repeated defoliation probably reduces the vigor of trees. If you have a tall tree from which you cannot safely remove eggs or tents, you may want to seek the help of a professional certified arborist. For “do-it-yourselfers,” insecticides labeled for use against caterpillars and containing the active ingredients Bacillus thuringiensis (Bt) or spinosad will provide excellent control of these tiny leaf eaters. Entomologists believe that eastern tent caterpillar populations run in cycles. After a few years of caterpillar plague, natural enemies such as predators, parasites, and pathogens reduce tent caterpillars to innocuous levels. The last several years have been modest years for these rascals. Perhaps Mother Nature’s sequestration program will deliver some relief from these noisome creatures.